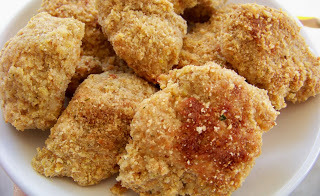 This master mix for baked chicken nuggets is just one of the many ways you can make a healthier version of chicken nuggets, this one just happens to be my favorite, originally came from my 30 day gourmet, freezer meals cookbook, and featured also over at whatsonmymenu.blogspot.com. I love it for the flavor, that you can control the ingredients, that they are baked, not fried, and also how versatile they are. Perfect for tossing into a cobb salad, or other dish, besides just eating the darned little yummy bites straight up! You can use a pre-boxed stuffing mix, or use my Make Your Own Stuffing Mix. This way you can control the ingredients in the breading even more, such as all whole grain breads, etc. Jan's tip: It does take a little bit of extra time to cut your chicken into bite sized chunks, but if you cut the chicken in a semi frozen state rather than thawed, it cuts through WAY easier! In blender or food processor blend stuffing mix (including any spice packet) and parmesan cheese until fine. Dip chicken into egg and then into stuffing mix to coat. place on greased baking sheet and bake at 425 degrees for abut 15 minutes. Turn nuggets and cook and extra 5 minutes. Freezing and Cooking Directions:-Label bags. Cool chicken and freeze in bags. Jan's Tip: If your kids are older, you can freeze 5-6 of them in individual bags for them to grab and reheat for a quick snack or lunch. To serve: Thaw and heat in microwave or oven.